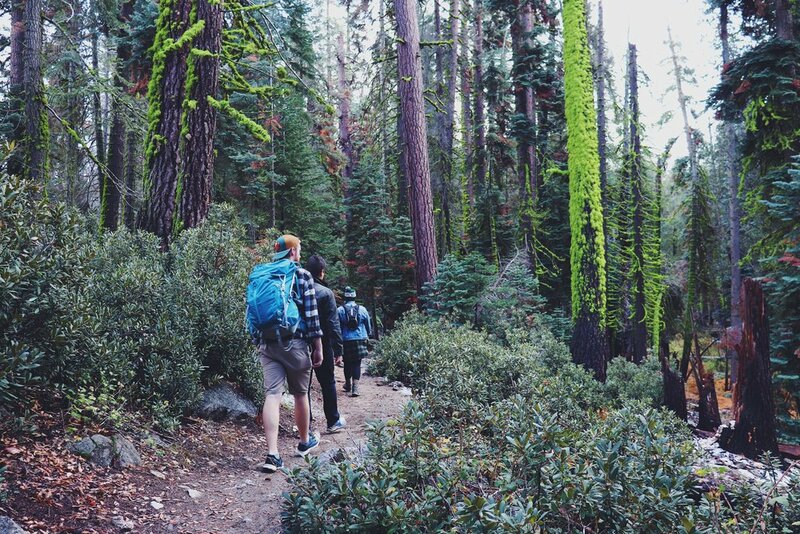 Sequoia and Kings Canyon National Parks encompass most of the southernmost Sierra Nevada mountains. Situated just south of Yosemite National Park and just east of Death Valley National Park, Sequoia and Kings Canyon can often be overlooked. But to skip over this lesser-known park would be a mistake - home to some of the largest trees in the world, the sights are a spectacle to behold. Sequoia National Park lays claim to General Sherman, which is by volume the largest known living single-stem tree on earth. It’s absolutely behemoth. My camera couldn’t possibly capture the size of it in one shot, but my 6-foot-tall boyfriend standing in front of it may provide a sense of scale. But standing in the immense shadow of General Sherman was just the start of our explorations - we had some hiking to do. After stopping into the gift shop to buy a trail map, we routed our way out on ‘the lakes trail,’ aptly named as it passes by Heather, Emerald and Pear lakes. The trail is popular with backpackers and fishing enthusiasts, but not so popular that it’s frequented with tourists. The full hike to pear lake and back is just over 13 miles - so we decided early on that we’d simply hike as far as we felt we could that day without any expectations about reaching the lakes. As we climbed in elevation, we saw a slew of deer - seemingly undisturbed by our presence - and happened upon some smaller wildlife, as well. The trees were dressed in their autumn best, as it was early October and the colors were on full display. On occasion we’d pass a group of friends returning from a night on the trail toting sleeping pads and fishing rods, which made me eager to return again to trail camp at the lakes. As we examined the trail map and hiked onward, we decided we’d reach ‘watchtower lookout’ to see what kind of view we might encounter. And while we made it to the lookout, we would up with no view at all! We still stayed at the top, peering towards the ledge wondering what we may have seen had it not been for the afternoon fog, and enjoyed our lunches. It was with mild hesitation that I Google image searched the view from watchtower point to see what we had missed - it was a painful dose of reality, as the view encompassed an incredible valley with a river far below. We tried to make up for it the next day by exploring more of the park’s sights before heading back to the city - we took a brief walk through Crescent Meadow, a beautiful clearing surrounded by redwood and sequoia trees. We also did all of the ‘hokey’ touristy things like climbing on top of the ‘auto log’ (called such because cars used to drive out on it until it became unsafe. 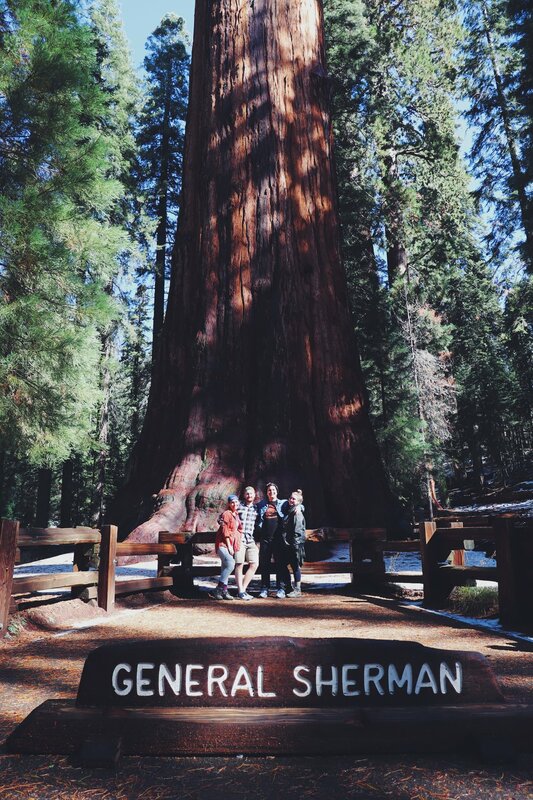 And of course, we drove under the fallen sequoia! How could we pass that up? Sequoia National Park did an incredible job of making me feel so small in the best way. There’s just something about the way standing in front of a behemoth tree that’s older than you’ll ever be can make you feel. It’s a sense of pure wonder I’m not sure I’ve experienced since I was a kid. I think if that feeling were a smell bottled up into a fragranced candle, it would smell like an alpine forest full of giant trees.